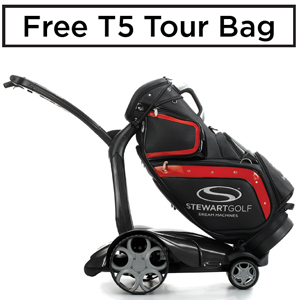 For September only Stewart Golf are giving away one of the newly released T5 Tour Bag worth 179.95 with each new Stewart Golf X9 Follow Lithium Electric Trolley sold. Combine the benefits of owning your Bluetooth enabled Electric Trolley with the incredible free golf bag deal Stewart Golf is offering where you can’t go wrong. Buy any X9 Follow Trolley and get a T5 Tour Bag (Choice of 3 colours) worth £179.95 RRP. Promotion starts on Tuesday November 28th 2017 at 9am and finishes at midnight on Sunday Decembr 31st 2017 (or until stock of the T5 Tour Bag has run out, whichever is earlier). This offer is eligible only with the purchase of any new X9 Follow trolley between the above dates. To claim your free bag visit www.stewartgolf.co.uk/free-bag-form and complete the form. All claims must be made via the Stewart Golf website; GolfOnline as a retailer is not able to redeem the promotion on your behalf. Claimants must have taken delivery of the trolley before the finishing date of the promotion. Proof of purchase is required in the form of a legible copy of the retail receipt or invoice clearly showing the product name and date of purchase. Send your proof of purchase by recorded delivery to Stewart Golf Ltd, Edison Close, Waterwells Business Park, Quedgeley, Gloucester GL2 2FN. You must make your claim within 30 days of date of purchase. Any claims made after this period will be invalid and no further claims can be made. The T5 Tour Bag is as stated and no alternative products (or cash alternative) may be substituted. If a trolley is returned for any reason, then the free bag must also be returned. The bag must be returned in its original packaging and any costs for delivery will be incurred by the customer. Stewart Golf reserve the right to withdraw this promotion at any time without any notice. This promotion cannot be used in conjunction with any other offers from Stewart Golf. Full Terms and conditions can be found on Stewart Golf Website.